Out of pure necessity, diverse tools to fight fires, have been in continuous development since time immemorial and advances continue to this day. In the third century B.C., Ctesibius of Alexandria (Egypt), a Greek inventor, designed the first hand-operated fire extinguisher pump. Similar pumps were used in 16th century Europe. 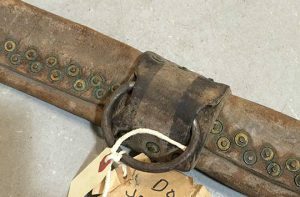 Leather fire hose with brass rivets. Brass loop was for hauling hose and suspending it off the ground. In 1672, Dutch Painter, Jan Van Der Heyden develops the first fire hose, which was made of leather with copper fittings. 1721 saw British inventor, Richard Newsham, patent the first fire engine pump, which was a twin cylinder, single-acting pump mounted on a cart. It could shoot water from a cistern as far as 135 feet while men worked the handles. In 1801, Frederick Graff, chief engineer of the Philadelphia Water Works, patents a post-style fire hydrant resembling what we use today. Previous hydrants had been more primitive. In 1813, British captain, George Manby, creates a device for catching people who jump from burning buildings. 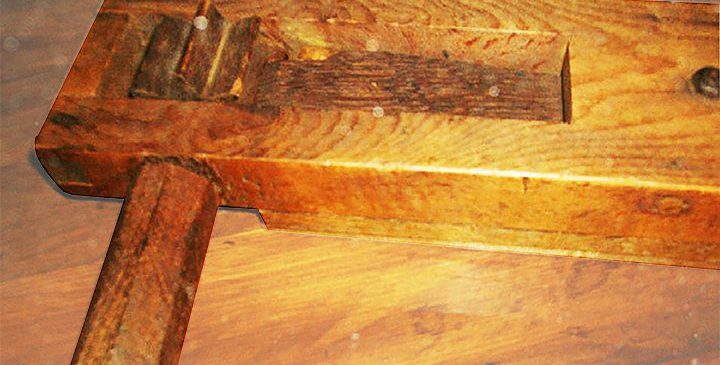 About 1723, British chemist, Ambrose Godfrey, creates an “automatic” fire extinguisher, a wooden cask containing a quantity of liquid and a pewter chamber loaded with gunpowder. In 1853, Miles Greenwood and two partners invent the first practical steam fire engine. Early breathing apparatus probably fed air from a hand-pump. The protective clothing worn by firefighters is called turnout gear. Firefighters originally wore uniforms consisting of thick wool pants and red shirts. Wool was chosen because it was able to shield the firemen against both heat and cold, plus it is mildly resistant to water and flames. They also wore rubber slickers over their wool uniforms. After World War II, the National Fire Protection Association (USA) imposed equipment standards and mandated that firefighters have a uniform with several layers — one that was flame-resistant, another moisture-resistant and another that provided thermal insulation. As technology improved, so did the materials used for these layers. Canada also followed these regulations. Early firefighters sporting full beards, sometimes wet them and inserted them into their mouths in an effort to filter the smokey air to breath. This was probably more effective at keeping beards from catching fire than for breathing! 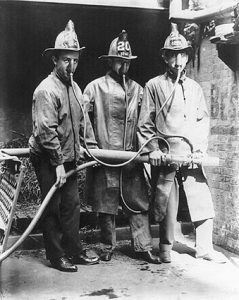 Later, firefighters used air which was hand-pumped from a bellows through a hose and into a “smoke mask.” Because they were bulky and unreliable they were found to be impractical and thus rarely used. The use of gas masks after World War I, was found to provide no protection from carbon monoxide. Gas masks did not work in an oxygen-deficient environment so were discarded as useless to firefighters. Today’s self-contained masks, which are connected to an air tank worn by the firefighter, prevent toxic smoke and gases from being inhaled. Early gloves used by firefighters were typically made of leather as were their boots which were knee-high. Eventually rubber boots became the norm and extended to the hips. Today’s gloves are made of a blend of high-performance fibres making them resistant to heat and fire. Firefighter boots are made out of a combination of synthetic materials, leather and rubber for protection and durability. The Canadian Fire Fighters Museum has a diverse collection of firefighting tools, gear and apparatus spanning a century.